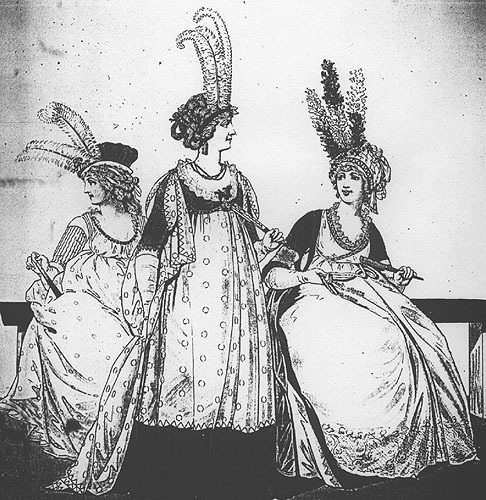 Above, Opera Dresses, from Nicholas Heideloff, Gallery of Fashion, 1796. For original dress description, click on link. Dress á l' Espagnole. The front hair combed straight on the forehead; the side hair in ringlets, and the hind hair in three loops, the ends returned in ringlets. Fancy-hat of white and lilac-coloured taffeta. White muslin gown; short sleeves, puffs, and Vandyke scollops of lilac silk. Small handkerchief trimmed with broad blonde. Pearl necklace. Diamond ear-rings. FIG. CII. 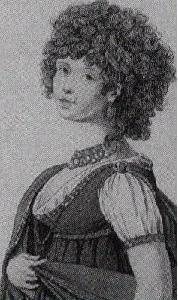 The front hair combed straight on the forehead; the side hair in ringlets: the hind hair turned up plain, and the ends returned in ringlets. Turban of silver net, looped at the right side with a silver band. One light-blue, two white brush feathers, and a large diamond pin, with a diamond aigrette, on the left side. Robe of yellow stained muslin; short sleeves. White satin girdle with small roses, and shoulder clasps. Small handkerchief trimmed with blonde. The toupee dressed large, and in small curls; plain chignon, falling very low on the back; two wreaths of green foil round the toupee; and a bouquet of white roses on the left side. Robe of silver tissue, embroidered in the shell pattern; short sleeves trimmed with lace; full épaulettes of Italian gauze. Tucker of broad lace. Wreath of green foil round the neck, fastened in the front and upon the shoulders with diamond rosettes. Sash of white satin riband, tied on the right side into a bow. Festoon pearl necklace, with a medallion. Large pearl ear- rings. Above left: New Roman style dress. Figure 87, 1796 (Vol. 2, No. 11) from Nicholas Heideloff, Gallery of Fashion, 1794-1800. 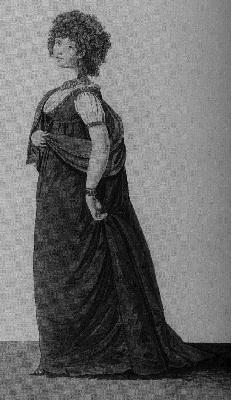 This is Plate 3 of the issue, featuring figure 87 and is labelled "New Dress, in the Roman Style, introduced at the Opera by a foreign Lady of distinction." Above right: Detail of hair and jewelry of same fashion plate. "... [the plate shows] a pelisse opera coat, without any seam in the back, composed of orange-blossom tinged with brown, made of Angola cloth, or sarsnet, trimmed either with rich Chinchealley [sic] fur, or sable tipt with gold; white fur will also look extremely delicate. The pelisse sets close to the form on one side, and is fastened on the right should with a broach; both sides may be worn close as a wrapping pelisse." "The chilling blasts of winter hastening to supersede the mild freshness of the autumnal evenings, and the Steyne, the Parade, and the hoarse-resounding [sic] Beach, with soon be deserted for the Opera, the ball-room, or the cheerful domestic fire-side. The almost universality of half-dress, so convenient and proper at a watering-place, will therefore, soon be laid aside for the more dashing and eccentric elegancies of fashion; and the purveyors of the different articles of female ornament, for we cannot call it attire, are all on the qui vive to bring out the newest thing." "The Mizra Turban and La Brada Mantle are also articles of novel elegance. They will doubtless have a great run during the winter. For the Opera-dress we think them peculiarly [sic] calculated.--The Persian costume is at this time much adopted, in every species of decoration, and we really think it is highly advantageous to British beauty. " The University of Washington's Notes on Theatre Going This site offers useful information on the times and types of entertainment offered in the nineteenth century.